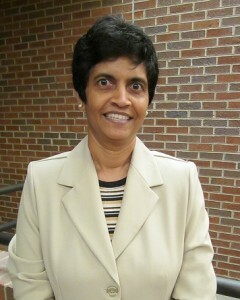 Purnima D. Pinnaduwage, Ph. D.
Ph. D. in Biological Chemistry from the Pennsylvania State University, Hershey Medical Center, Hershey, PA (1985). B.S in Chemistry, University of Colombo, Sri Lanka (1980). Cell/comparative biochemistry (BCMB) advanced lab course – spectroscopy, protein assays, enzyme assays, protein purification (ion exchange, affinity and gel filtration), Recombinant protein purification, gel electrophoresis(SDS-PAGE) and western blotting, Enzyme-linked immunosorbant assay (ELISA), polymerase chain reaction (PCR), restriction mapping and recombinant DNA technologies including cloning and transfection.